In March, hopeful homebuyers camped out overnight to reserve a unit in Bellevue’s forthcoming luxury condo tower, One88. Those prospective buyers committed to condos that won’t be ready until 2020. Very few condos are being built in our region, which has driven prices and demand to historic highs. That’s just one example of our area’s condo conundrum. 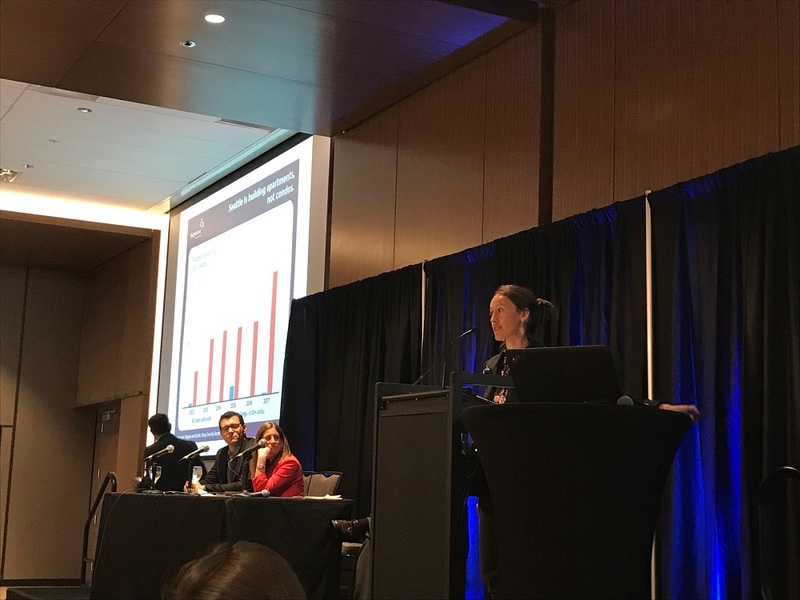 The situation is worsening because we’re not building condos, said Sightline Institute Senior Research Associate Margaret Morales at the REALTOR® Housing Issues Briefing at the Meydenbauer Center in Bellevue. 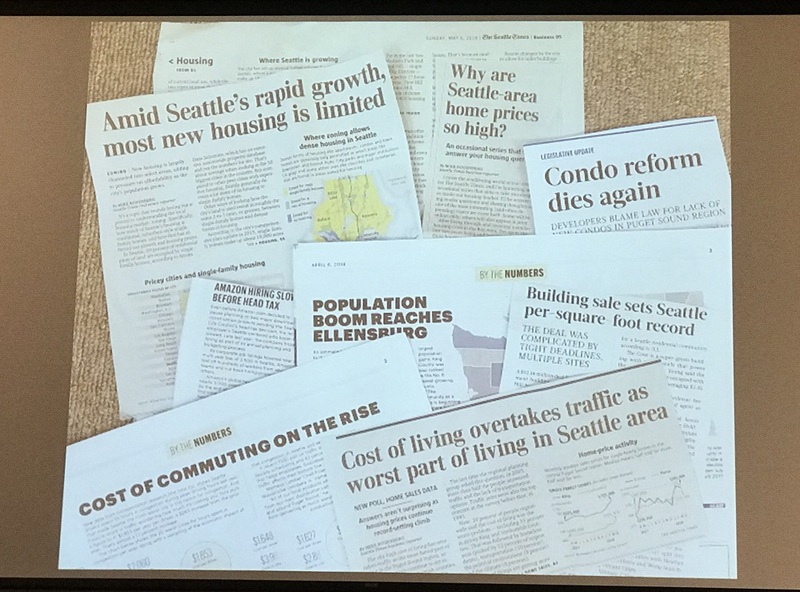 “Seattle had only several condominium projects built over the last five years,” said Morales. The One88 tower was Bellevue’s first condo project in nearly a decade. And at one point in 2017, there were just 355 condos for sale in King County, compared to nearly 3,500 in 2008. Morales cited three reasons why condos play a key role in our housing economy. First, condos broaden the price entry point for homeownership. In Seattle, the average condo price was two-thirds the price of the average single-family home on the market in April. Even when you consider condominium homeowner association dues, it’s still a much more reasonable entry price point for people looking to buy their first home. Second, condos meet an ownership niche. Particularly among the millennial and baby boomer generations, condos provide starter home and downsizing opportunities – if we had more affordable ones to buy. And finally, condos are a green housing option. A 2010 study by the Oregon Department of Environmental Quality found that multi-family homes are more energy efficient than single-family detached homes. A home in a multi-family, 8-unit property will use just half of the energy of a single-family home over the course of the homes’ lifetimes. Morales emphasized that efficiency and sustainability must be part of the conversation in making our cities livable for everyone. Despite these benefits and the demand for condos, developers still shy away from condo construction. The major reason that developers aren’t building condos is because of Washington state’s Condo Act. In 2016, the Runstad Center at the University of Washington released a study that found that insurance costs and the risk of litigation are factors that hold developers back from constructing condos. Modifying state condo law to reduce these risks and encourage cooperation between condo HOAs and developers in fixing problems as they arise without going to court would go a long way in putting more affordable condos on the market. The solutions are there, said Morales – and legislators are poised to make changes. 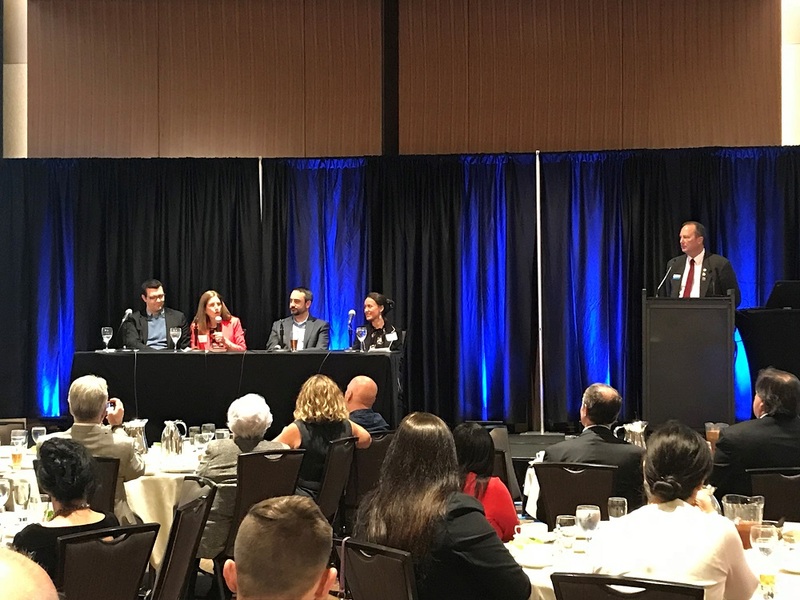 “Some of the innovation we need is going to come from state legislators who can do that big picture, systems-level thinking,” said Morales. See what solutions legislators are working on to address the crisis. For more on our condominium reform efforts, visit our News Center and HousingTranslator.com.